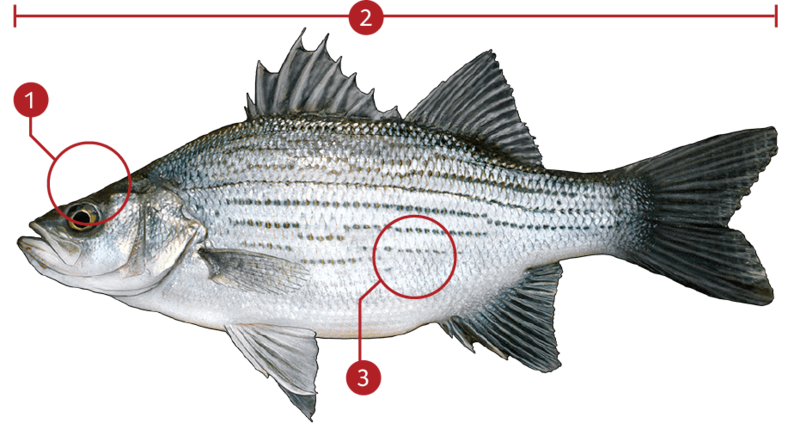 The white bass looks quite a bit like a shortened version of its larger relative, the striped bass. It has the same silvery white sides and black stripes. It differs most noticeably in being shorter and stockier with a smaller head, and the dorsal fins are set closer together. They can be distinguished from the yellow bass, by its more silvery color and regular, unbroken stripes as well as by its protruding, pugnacious looking, basslike lower jaw (in the yellow bass the jaws are about equal). It can be distinguished from the white perch by the latters lack of prominent stripes on the sides (though stripes may be present in very small juveniles). White bass are widely distributed throughout river systems of the Mississippi and Ohio valleys and the Great Lakes. They are native from the St. Lawrence River in the east, to Lake Winnipeg in the north, and to the Rio Grande in the west. Most abundant in clear lakes and reservoirs, they have been transplanted into the systems of various states including California.